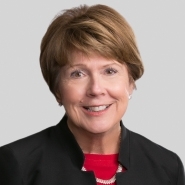 Partner Kathleen Trafford has been named to receive the 2015 Nettie Cronise Lutes Award, named for the first woman to practice law in Ohio. The award was created by the Women in the Profession section of the Ohio State Bar Association (OSBA), and recognizes women lawyers who have improved the legal profession through a high level of professionalism and have opened doors for other women. OSBA will present the award to Trafford during the organization’s annual convention April 30, 2015, in Sandusky, Ohio.